Allow me to paraphrase from the kit instructions for this one. Using the prototype A-8, the inline engine was removed and a 630 hp 9 cylinder Pratt & Whitney R-1690 radial was put into its place to become the XA-10. Testing proved it to be superior to the inline version and an order for 46 (a lot in the 1930s) was placed. As with the A-8, it was a curious mixture of the advanced and the anachronistic. The aircraft was an all metal monoplane with both flaps and slats, but kept fixed landing gear, struts and wire bracing. Though moved forward, the observer's position was still separated from the pilot by a 114 gallon fuel tank. The redesigned landing gear fairings contained a pair of .30 cal guns with a fifth mounted in with the observer. Normal bomb load was 10 30lb bombs stored vertically in cells along side the fuel tank. Most A-12s were used by the 3rd Attack Group during 1933/34 and were almost immediately assigned air mail duties for three months. It wasn't until 1937 that these planes were replaced by twin-engined A-17s. The remaining planes were reassigned to various units throughout the USAAC, including Hawaii where one was present during the Pearl Harbor attack. At least 10 were sold to the Chinese who used them ineffectually against the superior Japanese forces in 1937; few lasting more than a few months. 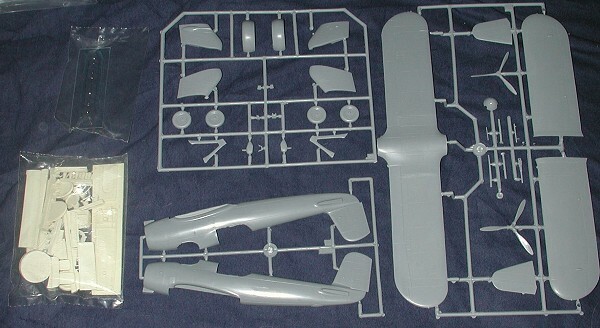 As you might expect, about half the sprues for this kit are the same as with the A-8 as they both used the same wing and tail plane. You do get different fuselage halves, wheel pants, and canopy. The vac canopy bits are well done and you get two of them. The resin is mostly the same as well with the addition of a multi-part radial engine that has a separate cylinder block, cylinders, exhaust collector, and push rods. The end result should be a most convincing engine. In terms of options, you have a choice of separate tail wheels (one spatted) and different gun mounts and guns for the observer. There is no indication in the instructions which options go with which decal selection so most will undoubtedly choose the simpler of the two! Interestingly, the unspatted tail wheel is a metal casting; a first for Czech Model as far as I can recall. Instructions are typical of Czech Model and are well done with a good history section, color notes and decal notes. The construction sequence is well thought out and though the construction of the interior may leave some doubt as to where the interior bracing goes, it will become apparent once building is underway. Good color information during construction is provided, which is most helpful. Decals are for three aircraft. Two very colorful aircraft of the 3rd Attack group. One with an OD fuselage and yellow wings with a white cowling and black/white fuselage band. 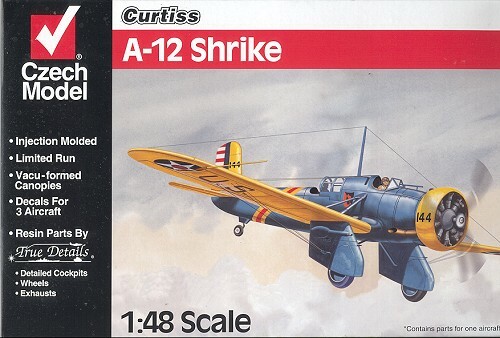 The other has a blue fuselage, yellow cowling and red/yellow fuselage band as shown on the box art. The third option is a tan/green over light blue camouflaged version of the Chinese Air Force. 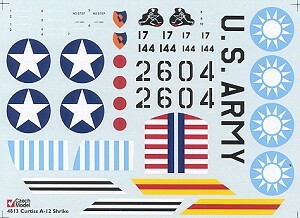 Decals are superbly printed and should work extremely well. If you are into the 'between the wars' aircraft of the 20's and 30's, then this is a kit that you should have. Since it is a short run kit, some experience with resin and vac bits would be quite helpful.